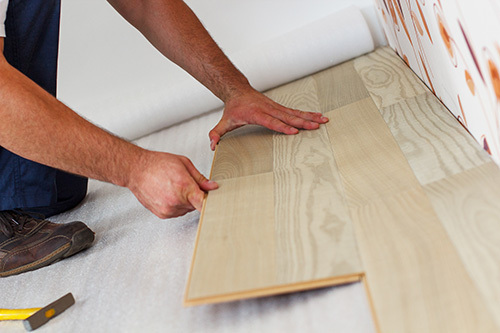 The problem of impact noise, associated with the replacement of traditional carpeted floor finishes with hard timber laminates or stripped floorboards, has come to the fore in recent years following the boom in house prices and associated DIY activity. 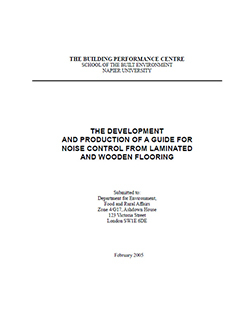 The Building Performance Centre at Edinburgh Napier University were instructed by Defra (Department for Environment, Food and Rural Affairs) to undertake a research project to investigate its severity, prevalence and the efficacy of different mitigation treatments. This fast track project involved a substantial social study into the extent of the problem and current methods of control of laminate flooring. The project involved field and laboratory testing of over 100 commonly used flooring materials in order to quantitatively assess the acoustic impact of the removal of a soft floor covering and the effect of typical mitigation measures. One of the outputs of the project was the publication of a guidance leaflet to inform the general public about hard floor finishes.